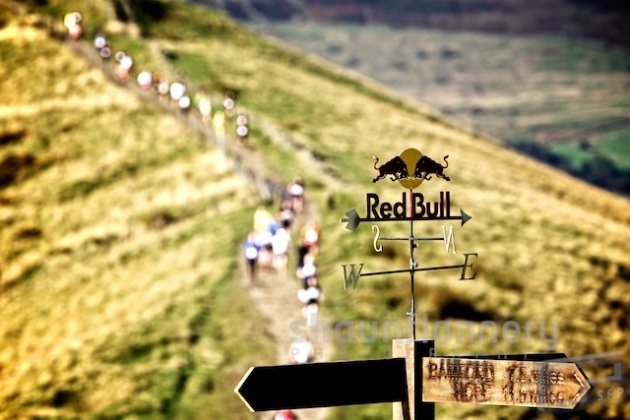 Without a doubt – the best (and hardest) race I have ever been a part of. It’s taken 2 weeks for my legs to forgive me, and I only managed 12 miles of it. I arrived in Castleton just before 8am, there was frost in the fields and a thick fog in the Hope Valley. I was starting to think I’d brought the wrong kit with me as I only had shorts & a vest. I could see huge green/brown mounds obstructing the horizon ahead of me, and I burst out laughing, on my own. These were real hills. Not like the ones we have in the south. These were the kind of hills you climb, not walk. The realization of what today was going to involve hit me and I knew I was out of my depth here. I went through a few warm up drills to loosen my legs up a bit and went and joined the rest of the runners at the start line. The lovely chap with the moustache and the pistol got us underway and off we went. 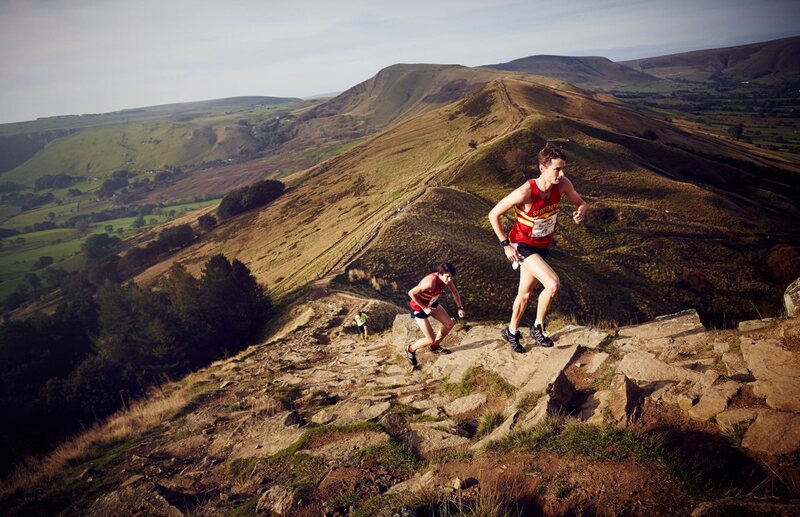 After about 400m of a gradual incline we headed off road and up Mam Tor. This was the part I’d been dreading – half a mile of bear-crawling up a mountain. It didn’t disappoint either. Every time I looked up it looked like we were still to come to the steepest bit. My Inov-8 Xtalon 212’s were brilliant here, not a single slip, they bit into the ground which was a mix of wet grass, loose earth and deep bracken. Worth every penny. The air was filled with panting, swearing and heavy breathing and somewhere in the distance I heard the gun go off again which meant the womens race had started. I arrived at the top and immediately got into a stride, choosing the grass over the wet stone path along the ridge. I was pleased with myself, I thought I’d conquered the hardest part of the course and that from here on in it was going to be easy…..how wrong could I have been. It was up here somewhere that there was a Brass Band playing, I think they were at the top of another climb that it was impossible to run up, it had stone stairs carved into it that sapped the energy from your legs as you pushed yourself up each giant step. Somewhere else on the course a lone bugler played the theme from Rocky to help get you across the difficult terrain. After 4 miles, the first scoreboard appeared. I felt like I’d covered at least twice that distance already but I was happy to see I was in 126th position. This meant that barring disaster I should make it through the 1st checkpoint in Bamford easily. Shortly after this the course dropped into the woods and we ran along some of the most beautiful single track trails I’ve ever come across. Concentration was absolutely key, as some of the footing was pretty technical. Loose rocks and uneven ground on fast descents meant that I was pleased to get to the bottom in one piece sometimes. As we approached Bamford we came alongside Ladybower reservoir which was spectacular, and it made for some particularly interesting running as we crossed narrow bridges and hopped over huge stepping stones. A mile or so later and I was sailing through the first checkpoint, my eyes tend to water a bit when running so I’m not sure what position I went through in. I saw a drinks station and grabbed a water and a 50/50 redbull/water. This may have been a mistake as I got quite a nasty stitch about 10 minutes after and had to ease right off for a few minutes. I’d heard that the first stage was by far the hardest and was looking forward to some relief in stage 2. However, the first half was all uphill (and we’re talking between 10 & 30% here) and my lack of training in the last few weeks was beginning to show. The scoreboard came up and I was in 136th position, with only 125 to get through at the next cutoff in Hope. 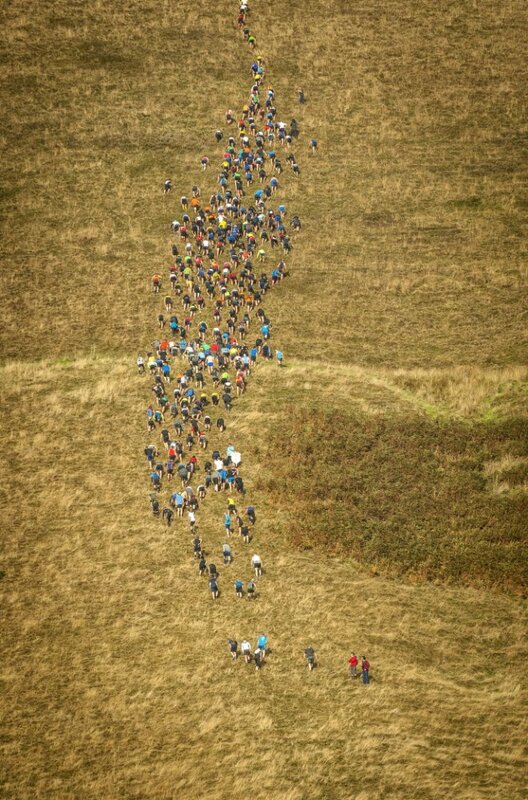 As I rounded a corner I could see about 20 runners within catching distance going up the next hill and I started to count back thinking I could pick them off. As we got to the top of the hill I could see the next 2 miles down into Hope, descending down a rocky single track pathway, along a field and a short road but all downhill. I got through the technical bit just fine, even picked a couple of runners off here, but the downhill got steeper and steeper and my quads got more and more upset with me. At this point I knew I was going no further. My legs were screaming at me to stop and as we hit the road, a marshall told us to keep off the verges and stay on the road. All I wanted to do was run on soft grass, the studs on my shoes were hurting my feet, my quads were on fire and the verge was just sitting there looking all soft and inviting. definitely not me! eventual race winner Andy Greenleaf here in 2nd place. I walked a few steps and someone came past me with words of encouragement which was enough to pick me back up. A few minutes later there were spectators cheering us on so I knew we were closing in on the checkpoint. We ran down a couple of streets I nthe village of Hope before bounding up a couple of steps behind a café and under the Red Bull inflatable. The counter was stuck on 126 and there were a few people sat down looking exhausted. I was directed over to the goody bags where I threw on my Hoody and downed some Red Bull. 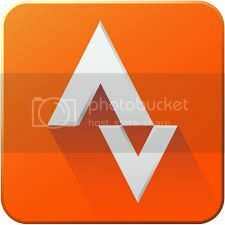 I was absolutely spent, I could not have run another step. No other race has ever left me feeling like this physically. But boy had I enjoyed it. But before I made it there I was joined by the man I’d raised money to say thank you to. Ray and part of his family (Caroline, Lucy & Sean) had made the trip up from Birmingham with bottles of fizz, they’d just missed me at the start, but had seen us going up Mam Tor. Then they’d hung around the finish waiting for me to get back. We shared a drink and a chat until I felt human again. So all in all, I made it through 12 hideously enjoyable miles and raised £1150.01 for cancer research. Not bad. 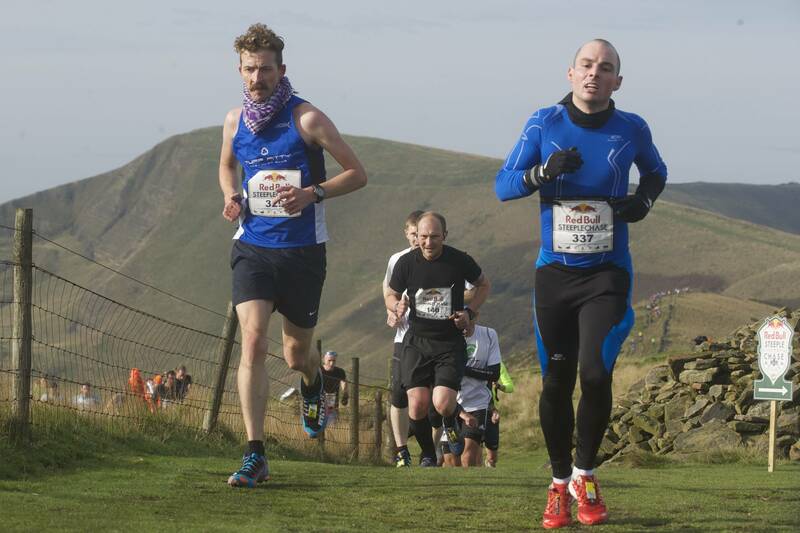 I hear its not coming back for 2015 but I’ll definitely be back for it in 2016, better trained and aiming for Edale. 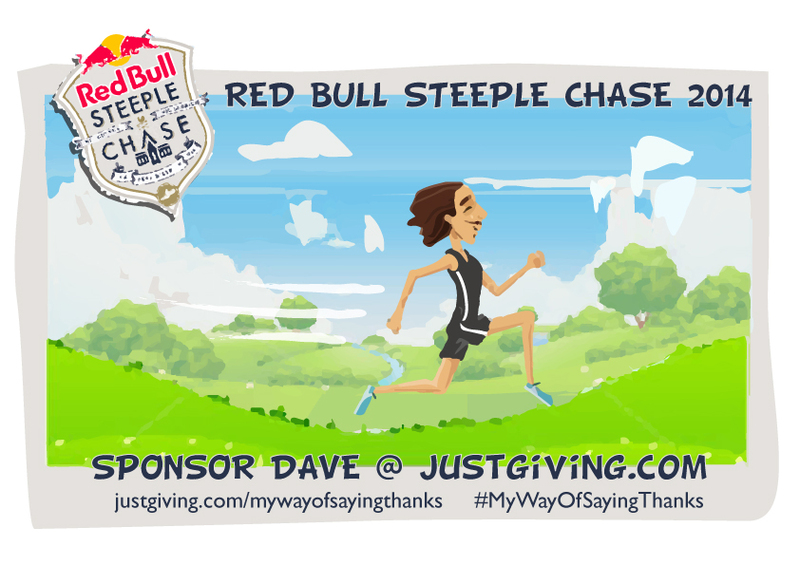 RED BULL STEEPLECHASE: What have I done? I don’t race very often. In fact, I haven’t raced once this year. I convince myself I’m too busy, whether that be with family life, work or studying for exams, I’m not sure. Maybe I am too busy, or maybe it’s something else. Maybe I’m scared of actually entering races, scared that everyone there is going to be better than me, scared that I’ll let myself down. I don’t know, but I definitely should enter more events as I really enjoy them, I should make time so I can no longer use that as my excuse. 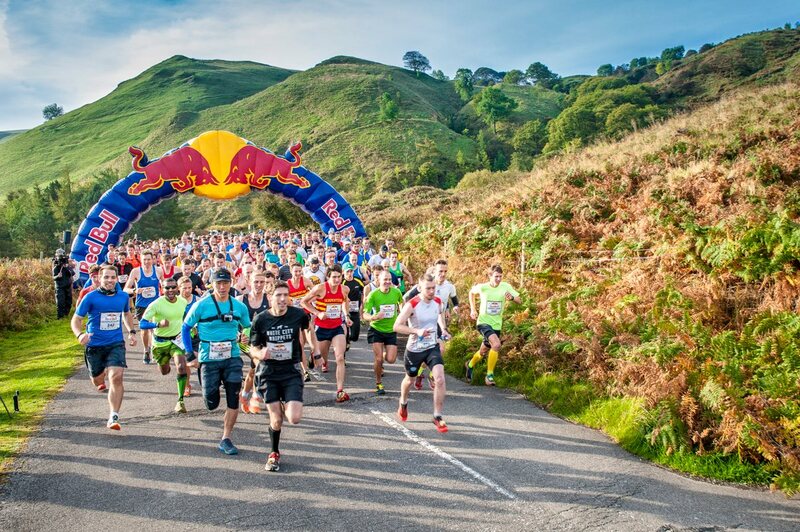 So, with that in mind, I’m not quite sure what lead me to enter what looks like one of the hardest races in England, the Red Bull Steeplechase. 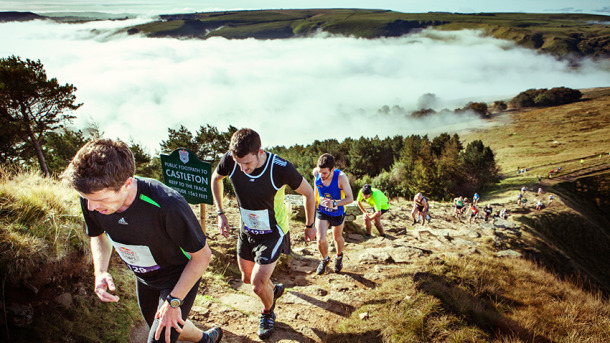 Aside from the fact I rarely race, this one is 226 miles away, and is essentially a fell race, and is potentially 21 miles long. But for some reason, once I’d read that entries were open, I couldn’t get it out of my mind. 500 runners start the race and a third of the field gets eliminated In a knockout format at various checkpoints along the route. These are actual steeples in villages across the Peak District. This goes on until only 40 runners remain to battle out the final 3 miles. Along the way, there’s 1400m (yep, that’s meters) of climbing to take care of and I’ve no idea how much descent. The first hill is apparently a 49% incline and goes for almost half a mile. It all sounded fine until the hills didn’t it? The scenery promises to be breathtaking (if the hills don’t get there first) and the hospitality is meant to be even better. So the idea of this race buzzed around my mind all day. I floated the idea of actually doing it with my wife who jokingly (I think) replied with, “don’t get injured.” This sounded like an invitation I couldn’t turn down, I could worry about logistics of getting there at a later date. 5 minutes later and my screen was thanking me for entering and suddenly, the nerves and doubts started creeping in. 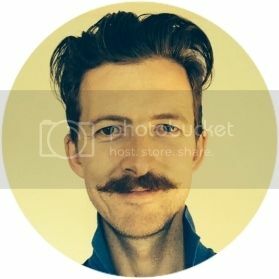 i started searching for reviews of the past 2 races. I came up with some superb, insightful write ups that clearly detailed the pain and exhaustion I could expect to go through on October 5th. As I read more and more about this race, the fear I was experiencing was gradually turning to abject terror. However, the one over-riding factor in all these reviews was the sheer joy felt by each and every athlete involved. Even if they only made it as far as the first checkpoint, they had taken away an unforgettable experience and promised to be back again. So here I am, 105 days away from the start line, about to draft a training plan. Where the hell do I begin? I’ve managed to talk a friend into it which helps, we always said we’d race together one day. I kind of envisaged it would be a parkrun. Unfortunately, he lives about a hundred miles away, so we can’t train together. He’s quicker than me over 5k too so I’ve got a lot to do to get the better of him. He’s talking about being happy with reaching checkpoint 2 – that’s 12 miles. My stupidity/blind optimism dictates I won’t be satisfied unless I make the top 30! Without doubt, I have never been as excited for a race as I am about this one. Bring on the Steeplechase!